The Holiday Inn Express Atlanta Vinings Hotel is a beautifully decorated 5-story, interior corridor hotel. Minutes away from Six Flags, White Water, Turner Field and many Atlanta attractions. 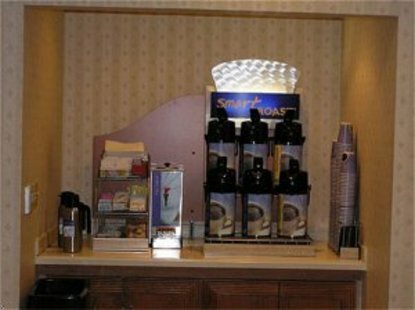 The Holiday Inn Express offers an Express Start complimentary deluxe breakfast bar served daily. Other amenities include large outside pool, guest laundry, fully equipped fitness center and complimentary HBO and Disney Channels. There are four meeting/banquet rooms with catering available. Visit Smyrna, GA and stay smart at the Holiday Inn Express Hotel. This hotel is committed to providing accessible facilities under the American Disabilities Act. If your accessibility needs are not met, please contact the Hotel Manager on Duty. Should you require additional information regarding accessible facilities for guests with disabilities, please call 1-800-Holiday (U.S. and Canada) or contact the hotel directly. For the hearing impaired, TDD service is available at 1-800-238-5544 within the U.S. and Canada.